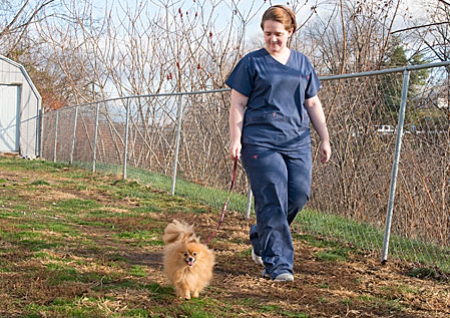 We offer pet boarding services as an added benefit to our patients. Separations can be hard on your furry family members, and we strive to make the time as easy and comfortable for them as possible. We invite our four-legged friends to sleep over while we provide daily care and monitoring. Pets are examined and weighed on arrival. They are fed well-balanced meals, monitored and walked daily, and are given brief exams every third day. 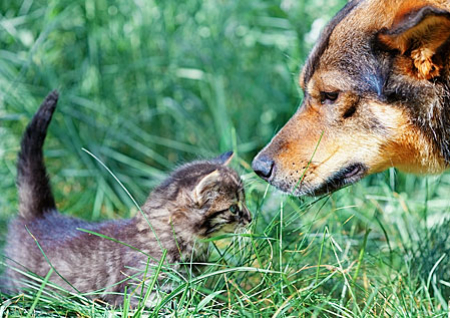 You can rest assured that your pet is in good hands while you are away. We adhere to certain requirements in order to provide the highest quality of care and safety for your pet during its visit. Animals must be free of fleas, ticks or other external parasites to stay in our boarding facilities. Animals with parasites will be treated at the owner’s expense. All animals hospitalized or boarded at our hospital diagnosed with internal parasites (worms) will be dewormed at the owner’s expense. Illness: If your pet should get sick while in our care, we can give them medical treatment as needed. This is especially critical for our diabetic and older patients who may need closer monitoring. Special Diets or Medications: If your pet is on a special diet or any medications you will need to provide them and any special instructions upon entry. Basic grooming for those pets that groomers can’t do.